On November 27 and 28, the Under 10 Hollyhocks participated in the Cranberry Classic Girls Hockey Tournament held on Cape Cod. 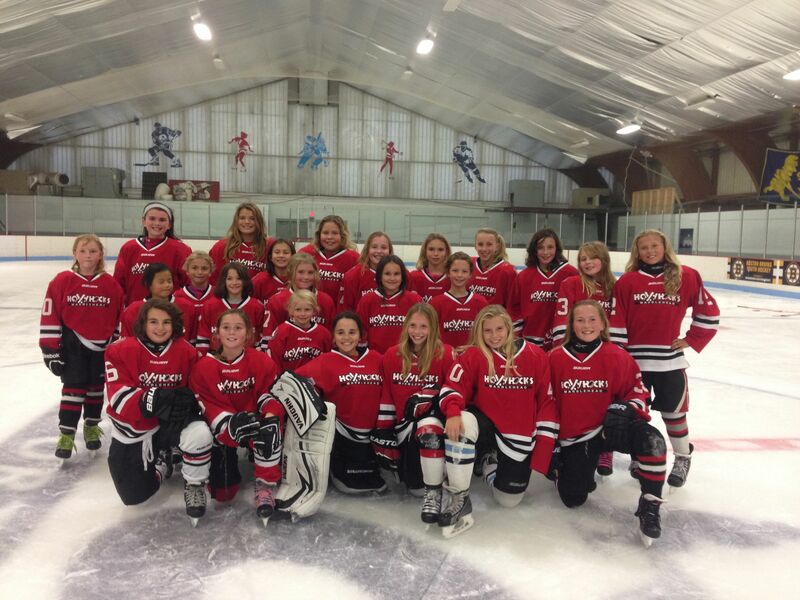 The Hollyhocks are the all-girls hockey program within Marblehead Youth Hockey Association, and for the past several years the Hollyhocks have participated in the Cranberry Classic, one of the largest girls hockey tournaments in the country. The Hollyhocks won the championship in their Under 10 division last year, and they returned this year to defend the title. On Friday, November 27, the Hollyhocks defeated the Darien (Connecticut) Ice Cats, 5-2. Madison Twombly started the scoring for the Hollyhocks in the first period to put the Hollyhocks up 1-0. In the second period, Elise Burdge assisted Brooke Brennan’s goal to make it 2-0, and Twombly netted her second goal of the game to make it 3-0. After the lead was cut to 3-1, Samantha Clock scored, with an assist from Elizabeth Savage. Brennan’s second goal of the game, assisted by Peighton Ridge and Burdge, gave the Hollyhocks a comfortable lead, and the Hollyhocks went on to win the game 5-2. Goaltender Kate Santeusanio was strong in between the pipes. Ashley Piersol, Penny Levine-Stein, and Paige Waldman all provided offensive firepower. Later in the same day, the Hollyhocks returned to the ice to play the Middlesex Lady Flames. After a period and a half, the score was knotted at 0-0. Middlesex broke through with a goal mid-way through the second to make it 1-0, and then added two more in the third to defeat the Hollyhocks 3-0. On the morning of Saturday, November 28, the Hollyhocks bounced back with a resounding 3-0 win over the Natick Comets. Brennan started the scoring in the first. Then, later in the period, Levine-Stein fired one past the Comets’ goaltender, with assists from Ridge and Twombly. In the third, Brennan scored a shorthanded goal, with an assist from Clock, to give the Hollyhocks a three goal lead. Santeusanio played well in net and recorded the shutout. Savage played strong on the blueline, and Piersol, Burdge, and Waldman created offensive chances throughout the game. A win in the fourth and final game would advance the Hollyhocks to the championship game, and a loss would keep them out. The Hollyhocks faced off against the undefeated Shoreline Sharks (Connecticut). The teams traded scoring changes throughout the first period, but the first period ended in a scoreless tie. Neither team scored in the second period, and the score was 0-0 heading into the final period. Midway through the third period, the Sharks finally scored to break the scoreless deadlock. The Hollyhocks pulled their goalie for an extra skater in the final few minutes and created some great scoring chances, but the Hollyhocks fell short and the game ended in a 1-0 loss. With the loss, the Hollyhocks finished third, missing a trip to the championship finals. Hollyhocks Lara Dolan, Amelia Pound, and Abi Amigo, all of whom have made significant contributions to the Hollyhocks overall success this season, could not make the trip to the Cranberry Classic and were missed by their teammates. In regular league play in the Middlesex Yankee Conference Girls Hockey League, the Hollyhocks have reeled off four straight wins to start the season, including a win on December 6 against previously undefeated Wellesley/Westwood. Against Wellesley/Westwood, the Hollyhocks fell behind 1-0 in the first period. Just 30 seconds into the second period, Twombly scored to tie game, with assists from Clock and Pound. Two and half minutes later, Twombly netted an unassisted goal, and she then completed her hat trick at the close of the period on a goal with assists from Burdge and Ridge. Brennan scored twice in the third period to build a 5-1 lead, and Santeusanio played well in goal for the Hollyhocks. Dolan, Waldman, and Pound created offensive chances at forward and played strong in the defensive zone. Levine-Stein and Piersol were strong on defense. The Marblehead Youth Hockey Association (MYHA) Hollyhock U-12 and U-10 teams had exciting, one-goal victories in the first round of the Middlesex Yankee Conference Girls Hockey League playoffs last week. The Hollyhock U-12 team defeated the Newton Dragons, 6-5 March 28. Marblehead struck first with a goal as a result of Megan Parthum, Bella Peters and Hadley Wales sparking the offense. The Hollyhocks went up 2-0 on a goal by Alia Piccinni. But Newton came back with two goals to tie things after one. Marblehead picked it up again in the second with three goals, while Newton netted one. Hollyhock goaltender Emily Ernst kept the Dragons in check with many superb saves, and Elena McCloskey, Maddy DiGiovanni, Cassidy Thibodeau, Caroline Corbett and Kendall Brant took care of the offense at the other end. Newton broke through two more times, but Marblehead showed tenacity to maintain the slim win. Head Coach Artie DiGiovanni remarked: "The girls played with great determination, and the coaches and parents are all very proud of the effort. We’re looking forward to the semifinals." The Marblehead girls will faceoff against Needham in the semifinals. The Hollyhock U-10 team prevailed in overtime, 5-4 over rival Winthrop. Marblehead jumped out to a 1-0 lead early in the first, but Winthrop quickly evened the score. Marblehead’s Chloe Trudel and Juliette Piersol netted goals to put Marblehead up 3-1 at the end of one. Winthrop started to take control in the second, but Marblehead withstood the pressure to stay ahead by two. Marblehead then extended the lead early in the third on a goal by Brooke Brennan, who took a great breakout pass by Samantha Clock to begin the scoring play. The momentum shifted again, however, and Winthrop began its comeback with three goals to send the contest to an extra session. In overtime, the teams traded excellent scoring chances, before Trudel broke free on an end-to-end rush. She then rifled her third goal of the game over the goalie’s shoulder for the dramatic win. Goaltender Kate Santeusanio made big saves throughout. Elle Seller and Taylor Brown were consistent and solid on defense. Forwards Ellie Burdge, Madison Twombly, Lauren Allain and Elizabeth Savage all played exceptionally well. Head Coach Michael Piersol noted: "This was a true team effort. Every girl gave her best, and everyone contributed in important ways throughout the game, just as they have been doing all season long." The Hollyhocks will now take on Natick Friday, April 3, in their semifinal round matchup. The Hollyhocks are an all girls MYHA program. Most of the girls also play on boys Squirt and Peewee teams, before coming together to form the Hollyhocks. This season, both the U-12 and U-10 teams participated in the Middlesex Yankee Girls Conference, and both also participated in the annual Cranberry Classic Girls Hockey Tournament on Cape Cod in November. More information about the Hollyhocks may be found on the Hollyhocks page at marbleheadyouthhockey.com. The MYHA Hollyhocks co-Directors are Michael Piersol and Karen Wales. MYHA is one of the town’s oldest organized youth sports programs, and it currently has 18 teams and around 200 players. The league offers Learn to Skate and Whack-A-Puck programs beginning in the fall for both boys and girls who are interested in learning about the sport. The 2014 Cranberry Classic U10 Champions! 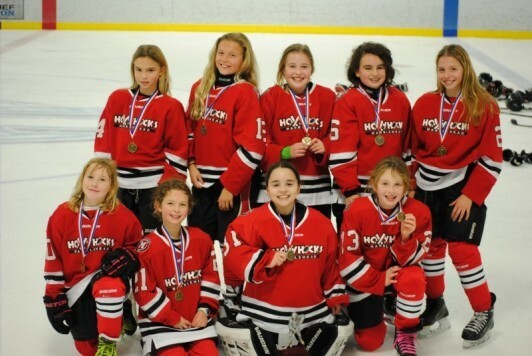 This past weekend, the Hollyhock under 12 and under 10 (major) teams participated in the Cranberry Classic Girls Hockey Tournament on Cape Cod, and had excellent results. The Hollyhocks under 12 team finished second in the six-team division in the opening round, before losing in the semifinals. The Hollyhocks under 10 team went undefeated in the opening round, and then went on to win 4-0 in the finals to bring home the gold medal. In addition to terrific performances on the ice, our Hollyhocks represented Marblehead exceedingly well by demonstrating great teamwork and sportsmanship throughout the entire tournament. The Hollyhocks had a fun time off the ice as well, where they bowled, had hotel pool parties, and developed great team camaraderie. The under 12 team members were Kendall Brant, Caroline Corbett, Ally Countie, Maddy DiGiovanni, Maddy Dombal, Elena McCloskey, Cassidy Thibodeau, and Hadley Wales. The Under 10 team was comprised of Brooke Brennan, Taylor Brown, Elise Burdge, Samantha Clock, Juliette Piersol, Kate Santeusanio, Elle Seller, Chloe Trudel, and Madison Twombly. The Cranberry Classic is one of the largest girls hockey tournaments in the United States, with more than 70 teams participating in divisions from under age 8 to under age 19. The tournament attracts mostly regional hockey programs that draw from multiple towns and cities, and Marblehead was one of only four town/city teams to participate, which makes their performances all the more impressive. The Hollyhocks participation in the tournament was made possible by the long-term grant to MYHA in the honor of Lynne Chandonnet, and by MYHA as part of its commitment to grow and promote girls hockey in Marblehead. Special thanks to Hollyhock Co-Directors Mike Piersol and Karen Wales for organizing the Hollyhocks' participation in this event. Thanks, also, to under 12 coaches Artie DiGiovanni (head coach), Karen Wales, and Tom Brant, and to under 10 coaches Mike Piersol (head coach), Remi Trudel, Steve Seller, and Dave Santeusanio. And thanks to the families who made the trip to Cape Cod and cheered and supported the Hollyhocks throughout the weekend. On Sunday, April 6th, 2014 the Marblehead Hollyhocks Girls U10 team narrowly lost 2-0 to Wellesley in the finals of the Middlesex Yankee Conference Girl’s Hockey League. After an impressive regular season, the Hollyhocks defeated Lynnfield in their quarterfinals playoff game 3-2 in four overtimes, and then earned their spot in the championship game with a dominating 5-0 win over Charlestown in the semifinals. After the championship game, the team ended their season with a post-game lunch at an area restaurant with their teammates, coaches, and families.